Construction work being carried out on the Hairatan-Uzbekistan rail project. A single, non electrified 75km rail track, where construction is in progress. A freight train from Uzbekistan stopping at Hairatan for offloading. 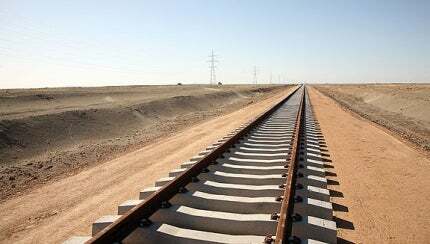 The Hairatan-Uzbekistan rail project is the first substantial common carrier rail road project in Afghanistan. The construction of the project was started in January 2010 and completed in November 2010. The line was first opened to the public in August 2011, after successful completion of test runs. The 75km rail link connects Hairatan on the Uzbekistan-Afghan border to the city of Mazar-i-Sharif in northern Afghanistan. The project was built by the state-owned Uzbekistan Railways (UTY). The estimated cost of the project was $170m, of which $165m was provided by the Asian Development Bank (ADB). The remaining $5m was provided by the Afghan Government. The project runs in the cooperation of the Central Asia Regional Economic Cooperation (CAREC) Programme. The Hairatan-Uzbekistan project is part of the transport strategy and action plan of the Central Asia Regional Economic Cooperation Programme and aims to boost freight volumes and the profile of Afghanistan as a transit hub. Afghanistan is centrally located and has the potential to become the focal point for transportation of goods to Central Asia, Pakistan, South East Asia and Europe. "The 75km rail link connects Hairatan on the Uzbekistan-Afghan border to the city of Mazar-i-Sharif in northern Afghanistan." Freight trains from Uzbekistan stop at the Hairatan border to offload and reload into trucks, which results in cost overruns and delays. To overcome these delays, the Afghan Government has entered into direct EPC, operation and maintenance contracts with Uzbekistan Railway Company. Uzbekistan Railway was the obvious choice because there were no other comparable companies in the region capable of undertaking such a project. The company already had proprietary preliminary designs, which were used to speed up the project, thereby reducing time and cost investment. There are plans to extend this route into the west to Herat and east to Shirkhan Bandar. At Herat the line will connect to Iran and at Shirkhan Bandar with Tajikistan. These future lines will create a rail corridor through north Afghanistan and enable freight coming from Tajikistan and Uzbekistan to reach Persian Gulf ports on rail, avoiding the need to pass through Turkmenistan. The Amu Darya river is located at the border between Uzbekistan and northern Afghanistan. The Friendship Bridge, which was built by the Soviet Union, was the only crossing between the two countries prior to the opening of the rail link. Freight coming into the country was transhipped from rail to road in Hairatan. The bridge, which has a road and a single rail track, was becoming increasingly busy with wagon trains coming into Afghanistan and causing congestion at the borders. "The estimated cost of the project was $170m, of which $165m was provided by the Asian Development Bank (ADB)." In 2009, 4,000t of freight was being transported to Afghanistan from Central Asia each month. According to ADB’s estimates, this is expected to increase to 40,000t a month from 25,000t with the increased inflow of agricultural, oil, fertiliser and construction materials into the country. The aim of the project is to ease road traffic and reduce accidents, road maintenance and pollution. The project involved the construction of a single, unelectrified railway track between Hairatan and Mazar-i-Sharif, the second largest city in the country. This line is an extension of the Termez-Hairatan line, which is the entry point of more than half of country’s imports and humanitarian aid from abroad. The project also upgraded Hairatan station and covered the construction of the transhipment terminal at Gur-e-Mar near Mazar-i-Sharif. In addition, it provides support to the development of the country’s railway sector. The Hairatan-Uzbekistan rail project was approved by ADB in July 2009 and fact-finding missions were carried out in August 2009. In September 2009, the bank announced its decision to finance the project. UTY was awarded the $129m construction contract in November 2009. As an exception to the usual procurement rules, tenders were not invited because it was unlikely that any other company would bid for the project due to security reasons. Design review and construction supervision contracts were awarded to SMEC International and an Uzbek firm Islohotkonstaltservis in November 2009. The Ministry of Public Works is the executing agency of the project. Uzbekistan will provide commercial services to the 75km railway line in addition to operating the line, under a three-year contract signed with Afghanistan in August 2011. The Hairatan-Uzbekistan railway line has been built on a flat plain and has an elevation of 350 to 550m. It is a featureless, barren land with no natural vegetation. "The rail road is a 1,520mm standard gauge with passing loops at every 20km." The rail road is a 1,520mm standard gauge with passing loops at every 20km. Each loop is 1.7km long and designed to accommodate trains with 100 wagons. It also adds capacity to two CAREC transport corridors – Corridor 3 and Corridor 6. CAREC corridors link the major economic hubs of the region. Most of the rail road has been constructed away from the inhabited areas owned by the government. The construction of the security related infrastructure for the Hairatan-Uzbekistan rail line was started in December 2012 and is scheduled for completion by March 2013. The Hairatan-Uzbekistan rail project did not require any new investments in rolling stock because Uzbekistan vehicles have been used. Uzbekistan obtained its railway fleet from the Soviet Union during the separation in 1991.